A new family of typefaces. And the discovery that everything I’ve ever learned about optical size might be wrong. 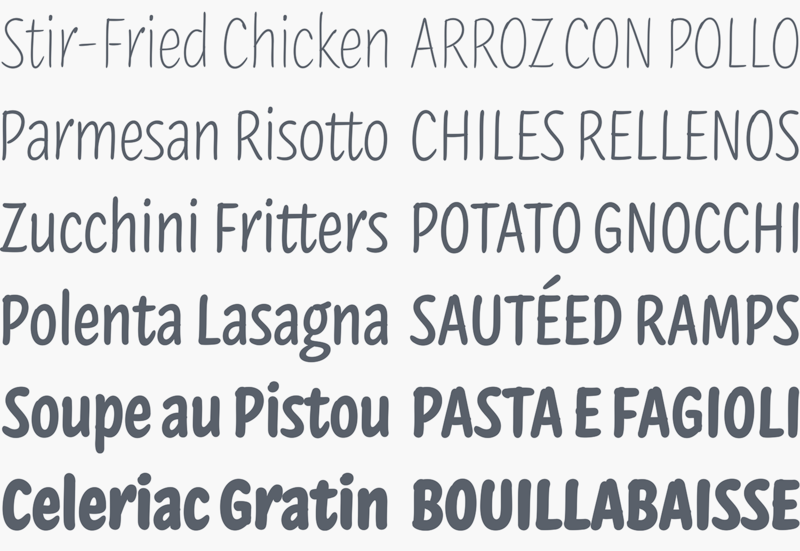 Today, we’re publishing a new family of typefaces called Inkwell Condensed. 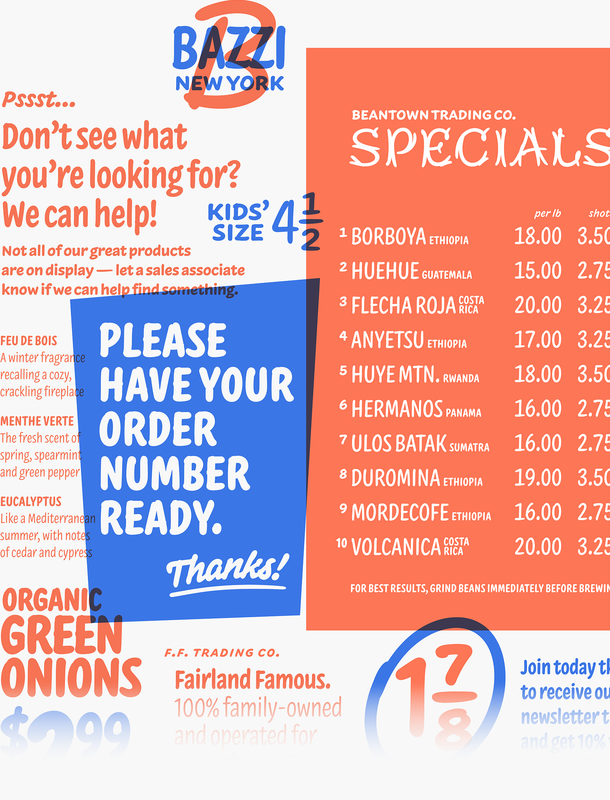 These six new styles are part of the Inkwell universe of ‘handwritten typefaces,’ designed to have the informality and expressiveness of writing, but the credibility and ease of type. We’re rolling them into the Inkwell Complete package, so they’ll be a free download for existing licensees of those fonts, and available to purchase individually if you’re new to Inkwell. But first, an observation about size and shape that has me wondering if everything I’ve ever learned about optical size is wrong. 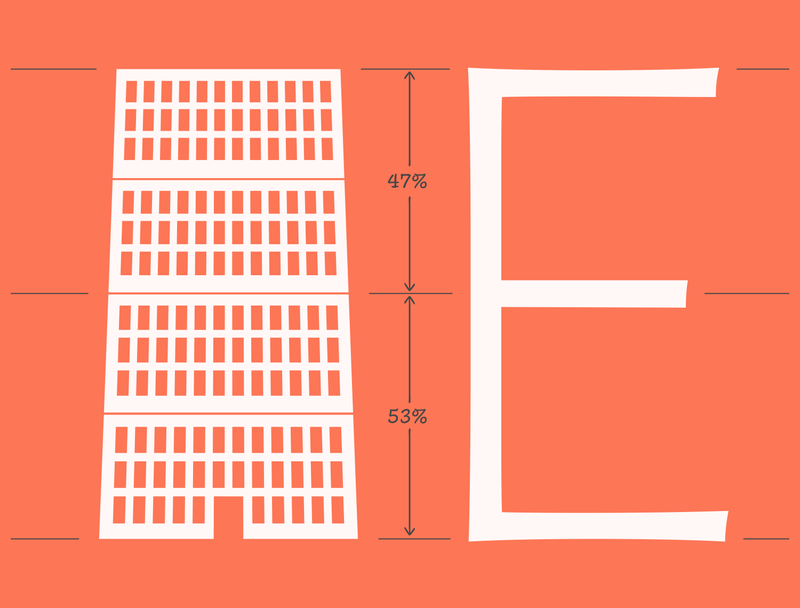 A typeface’s optical size is the scale at which it’s intended to be used. When a display face is redesigned for smaller sizes, its thin strokes are thickened, its gestures are amplified, its proportions are adjusted to favor small shapes (the entire lowercase usually gets substantially bigger), and additional white space is added wherever it can help relieve congestion: counters are enlarged, apertures opened, and inter-character fit is loosened. The net effect of these changes is an overall widening of letterforms as they get smaller, as a quick comparison of related text and display faces will confirm. Our tidy conclusion is that at small sizes, wider letters are easier to read. And while this is demonstrably true, it conceals a cunning logical fallacy. We can’t prove its reverse statement (its ‘contrapositive’), that at large sizes, narrower letters are easier to read, and wider ones harder. This is observably not true, so something’s up. When Jordan Bell and I first began drawing Inkwell Condensed, we had a hard time keeping the design from looking too slick. Inkwell is a collection of informal, unmannered designs, expressly designed to reveal the presence of an author behind the words. Yet our earliest drawings for the Condensed were almost instinctively polished, like the lettering of signs in supermarket windows (whose bouncy nonchalance belies the practiced hand of a master signpainter.) Somehow the other Inkwells had succeeded in feeling less like the work of a commercial artist, and more like the patient block lettering of a competent and determined doodler. But the Condensed was going its own way. What neither of us noticed was that we’d been drawing at a larger size than usual, where it was easier to control the design’s steep angles and compact curves — and this is where size, proportion, and style begin to connect. The other Inkwells had been drawn at handwriting size, where the fingertips can comfortably guide a pen in circular motions. But these new drawings came from the wrist, which is given to large, fluid curves — and, because its functional range of motion is twice as vertical as horizontal, it draws shapes that are taller than they are wide. Our wrists are more flexible with up-and-down extension and flexion than with side-to-side ulnar and radial deviation. 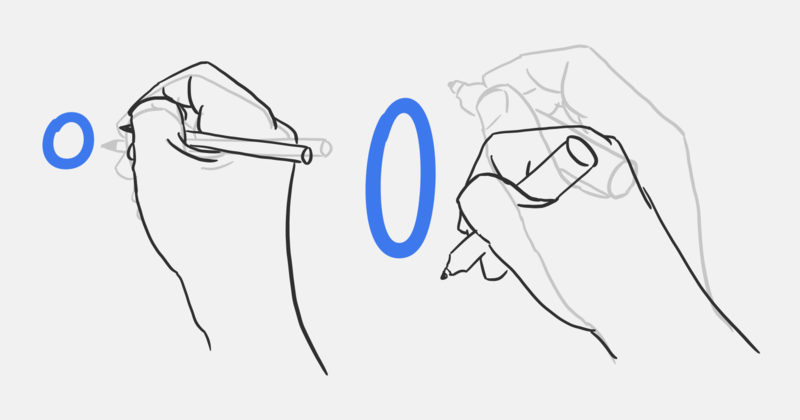 Try it: with a stiff arm and loose wrist, draw wide circles in the air with your index finger, and notice how much easier it is once you compress the circle into an upright ellipse. This fact of our physiology may be part of our comfort and familiarity with condensed letterforms at display sizes: it’s not that they’re easier to read, but that at large sizes, narrower letters are easier to write. If Inkwell Condensed has the same optical size as the other members of the Inkwell family, it might be said to have a larger carpal size, feeling most natural when it’s taller than the handwriting-like typography it accompanies. We’ve worked to ensure that it has the same candor and lack of pretense as the rest of the Inkwell family, and feels like the product of the same capable but unstudied hand. Because we’re used to seeing tall writing in public, Inkwell Condensed ably handles the kinds of lettering that once went only to signpainters: price lists, placards, covers and posters seem to be its métier. Inkwell Condensed by H&Co. From $129, exclusively at typography.com. For designers and developers: Cloud.typography now includes the complete H&Co library. And for everyone, we now offer self-hosted web fonts to serve from your own architecture. A lot has changed since we launched Cloud.typography. Browsers have gotten smarter about type, mobile devices have gotten clearer, and everyone’s learned that a website’s fonts play a critical part in making a good first impression. And all the while, we’ve been learning from tens of thousands of designers, developers, agencies, brands, and businesses about how they work, what they need, and how typography needs to work for them. So we’re very pleased to offer two new major upgrades that make it easier than ever to step up to web fonts by H&Co. Cloud.Typography, now with all the fonts. For years, Cloud.typography has included any five fonts of your choosing, and the rest available to purchase. Today we’re making things a lot simpler, a lot more flexible, and a lot more valuable: every Cloud.typography subscription now includes access to our complete library of fonts to use on the web. We’ve been listening: to developers who like to work offline, to website owners who prefer to serve from their own architecture, and to organizations who need to publish without third-party integrations. So today, we’re pleased to introduce self-hosted web fonts from H&Co. Whether you’re a Cloud.typography subscriber or not, now you can license any of our fonts for self-hosting, and download them as both woff and woff2 files. In place of Cloud.typography’s Character Set panel that manages complex character sets, H&Co’s self-hosted web fonts use the same OpenType features as our desktop fonts, so that typographic features like small caps or tabular figures (or Stylistic Sets!) can be implemented even more easily, using the CSS font-feature-settings property supported by all modern browsers. Self-hosting licenses are priced by pageviews per month, and designed to be scalable and affordable for organizations both large and small. And we’re offering self-hosting licenses as either a fixed-cost annual subscription, or a one-time perpetual plan. You’ll find these options available on every font’s product page. Compare cloud-hosted and self-hosted web font options. Some of the most interesting discussions about typography never get shared with designers. I’d like to change this, and hope you’ll join me in a conversation that explores typography. Typeface design has a lot of discarded bycatch: small discoveries and observations that aren’t large enough to develop, but are nonetheless interesting and useful. Instead of allowing these ideas to perish, I’d like to preserve and share them, with the hope that they’ll be helpful, diverting, or inspiring to other designers. This month, researchers made official something that typeface designers have long known: that horizontal lines appear thicker than vertical ones. At left, a square made from equally thick strokes; at right, the one that feels equally weighted, its vertical strokes nearly 7% thicker than the horizontals. This phenomenon, central to typeface design, has implications for the design of logos, interfaces, diagrams, and wayfinding systems, indeed anywhere a reader is likely to encounter a box, an arrow, or a line. Published in the journal Vision, this peer-reviewed paper confirms that most people overestimate the thickness of horizontal lines. This is the very optical illusion for which type designers compensate by lightening the crossbar of a sans serif H, an adjustment that’s easily revealed by looking at a letter sideways. When rotated, the evenly-weighted Gotham is revealed to have thicker verticals than horizontals; try the same in Ideal Sans, a typeface designed to push against the boundaries of what we normally notice when we read, and it becomes clear how little we actually see of what is there. This new study by de Waard, Van der Burg, and Olivers explores different theories as to why we see these things the way we do. Cultural forces presumably play some part: Western typeface designers have long been taught that our bias about weight and directionality stems from the role of the broad-edged pen in European calligraphy, which still underpins our expectations about what letters should look like. (Even the most monolinear letter A has a thin side and a thick, an enduring vestige of calligraphic patterns.) Intriguingly, the divergent traditions of Arabic and Latin calligraphy have a detectable influence on perception, for which the authors offer some interesting statistics. But they go further, to offer some compelling physiological explanations for the phenomenon. One possibility, proposed in an article from the Journal of Experimental Psychology cited by the authors, suggests that our field of vision — more horizontal than vertical — has an effect on the relative perception of size. Also mentioned is a 2002 article by Catherine Q. Howe and Dale Purves, published in the Proceedings of the National Academy of Science, which hints at a larger explanation for all optical illusions, a theory to which I’ve long subscribed but never seen argued: that, because our brains evolved to reckon with the three-dimensional world, the expectations that bring to bear upon two-dimensional forms often don’t apply. When there’s a disconnect between what we see and what we expect to see, we experience this as an optical illusion. Subscribe to our new newsletter about exploring typography. Five non-obvious ways to use type to evoke the speed, power, and control of performance racing. Relieve the corners. Above, in the Isotope N, the font’s energetic movement comes from the placement of its curves and corners. In a typeface that generally has sharp edges, subtle curves on the outside diagonal corners help to heighten the momentum through the line. Choose extreme proportions. Idlewild’s pronounced width is accentuated by gestures that extend outward, like the elongated tail of this capital R. A typeface originally inspired by lettering on cruise ships and jet fuselages, these proportions have long been used to symbolize the perfect balance of speed and control. Look for controlled dissonances. Even unexpected genres like the slab serif can achieve a feeling of speed. Above: more sophisticated than a simple rounded rectangle, the Vitesse typeface contrasts round sides and flat bases to introduce a dynamic tension. Even the simple letter O has moments in its ‘corners’ where its material seems to bend almost to the point of breaking, adding a little drama to what could otherwise be a unadventurous letterform. Tighten the curves. Letters in the Tungsten Compressed family take every opportunity to square up against their sides, to convey a clean, engineered feel. Instead of slowly moving through a graceful curve, the spine of Tungsten’s S has tight turns that quickens the movement, creating a brisk, staccato tone. Turn up the contrast. In the Peristyle typeface, the stark contrast of thicks and thins is never more dramatic than in its letter M, which cycles rapidly between quiet and loud timbres. As the font gets heavier, and the distinction between dark and light strokes becomes more pronounced, adding a little letterspacing helps make the font rev louder. A collection: Twenty fonts for motorsports.